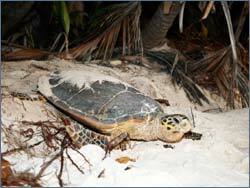 Gopher Tortises and Sea Turtles are found on our beaches and often mistaken for each other. Check out our Share the Beach brochure (26MB). St. Johns County's guide to sharing and protecting the beaches. Use designated walkovers. Please stay off dunes and vegetation. Limit driving time on the beach; exit beach at nearest beach ramp. Stay out of Conservation Zone, 15 feet seaward of the dune line. At the end of your visit fill any holes left by sand castles and tire tracks. Do not leave beach chairs or canopies on the beach overnight. Reduce litter and marine debris – dispose of trash properly. Pick up any fishing line and plastic that you see and participate in beach clean-ups. Never approach sea turtles emerging from or returning to the sea. 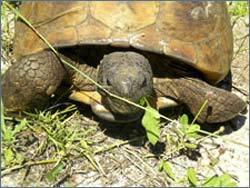 Nesting females are vulnerable and timid, and can be easily frightened away. 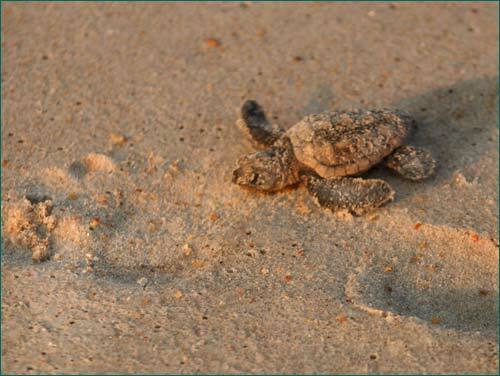 Please report all dead, injured, stranded turtles and hatchlings or anyone harassing sea turtles or their nests to 1-888-404-FWCC. Remember: Leave only your footprints in the sand.